The Rockfon Artic ceiling kit offers excellent sound absorption along with 100% humidity resistance, perfect for offices, retail units and changing rooms. The ceiling provides a clean, modern finish to help brighten up your workspace. The ceiling kit includes all the primary components for a suspended ceiling, allowing for quick and easy ordering online, just select your size, then add to basket. Order a suspended ceiling kit package from 10-100m2. Select from the dropdown box above to choose your size. To calculate the M2 area, simply multiply the width of the room by the length (e.g. 5 x 6m = 30m2). 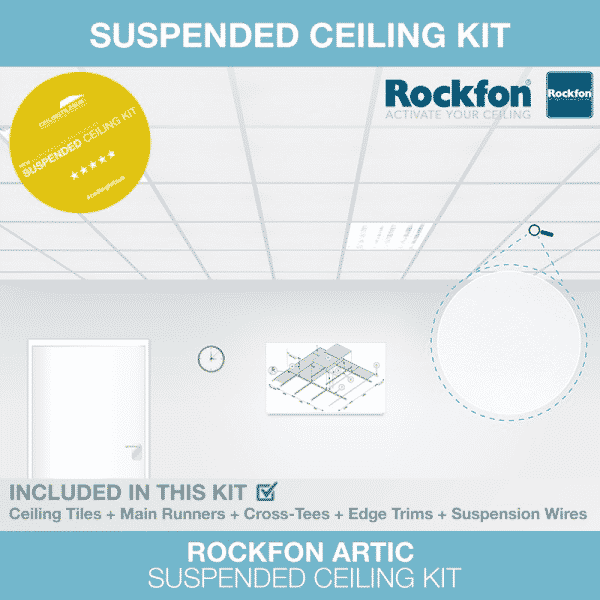 For other sizes, bespoke shaped areas or if you’d just like some help from our expert suspended ceilings team, try our online Ceiling Kit Quote Tool. Note: The gridwork included may be from a different manufacturer to help speed up delivery timescales. However, it will always be high performance, European manufactured in accordance with British standards. 6 No. 36 No. 36 No. 7 No. 1 No. 30m2 3 boxes (96 tiles) 8 No. 48 No. 48 No. 9 No. 1 No. 40m2 4 boxes (128 tiles) 11 No. 64 No. 64 No. 10 No. 1 No. 50m2 5 boxes (160 tiles) 14 No. 80 No. 80 No. 11 No. 1 No. 16 No. 96 No. 96 No. 12 No. 1 No. 19 No. 108 No. 108 No. 13 No. 1 No. 80m2 8 boxes (256 tiles) 21 No. 126 No. 126 No. 14 No. 1 No. 90m2 9 boxes (288 tiles) 24 No. 140 No. 140 No. 15 No. 1 No. 100m2 10 boxes (320 tiles) 26 No. 154 No. 154 No. 16 No. 1 No. Usually a standard stock product. However, stocks can vary nationwide. Delivery dates will be confirmed via email once the order has been received and processed. Delivery timescales are provided on each of the product pages, however these are a guide and subject to local stock and delivery location. We will always aim to improve on estimated delivery times where possible. If a delivery is expected to arrive later than stated above, we will contact you to discuss options available. Timescales are based on standard working days only (Monday to Friday) excluding bank holidays. Delivery of our products are made via various methods. Small quantities: (1-3 boxes and smaller items) are usually despatched through a national courier company direct from our head office. Larger quantities: (4 + boxes, long lengths and bulky products), will be palletised and sent via our own vehicles, through our supply network or a national pallet company. Please note, delivery is classed as “kerbside” whereby the driver is not insured to help physically unload your goods from the vehicle to your premises, please ensure you have provisions to cater for this or let us know if this will be an issue. Note: Standard charges are applied to most UK Mainland destinations. We are able to deliver to Channel Islands, Isle of Man, Isle of Wight, Scottish Highlands and other offshore destinations at an extra charge. Please call before placing order for best price and expected delivery timescales. Do You Require An Urgent Delivery? If the delivery is required urgently, assuming in stock, we can arrange a dedicated same/next day courier for an additional charge – please call 01242 862173 for details. Further detailed information regarding our delivery can be found in our terms & conditions. Please also see our damages & returns policy. Got a large job and need some even better prices? We can help! Although our prices are regularly checked to ensure they are very competitive, we can look to discount even further on large projects. Let us know the details and we’ll aim to give you the best rate possible. Ceiling Tiles UK will aim to match or beat any genuine ‘like for like’ quote from another supplier. Please ensure it is like for like before challenging us, many tiles are designed to look the same but priced at different levels by the various manufacturers. Important – The UK market has recently seen a large influx of imported products, particularly from the Far East. These products often have no performance data associated, especially crucial in terms of ‘Reaction to Fire’. Our advice would be, if the price seems too good to be true, there is probably a reason for this. 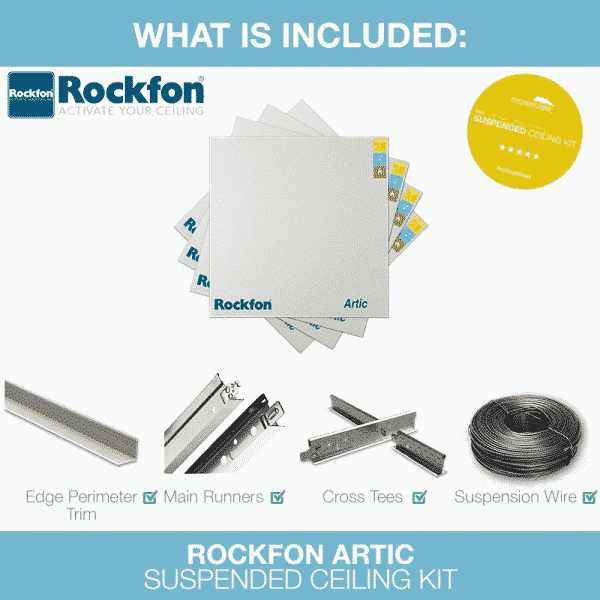 Always aim to buy products from the leading manufacturers, these include: AMF, Armstrong, British Gypsum, Burgess, Ecophon, Rockfon and Sektor Ceilings. All products on our website have been tested to ensure they are suitable for the UK and European market. Simply let us know the product you are after, where you found it and what the price you have been quoted and we’ll do our best to beat it!